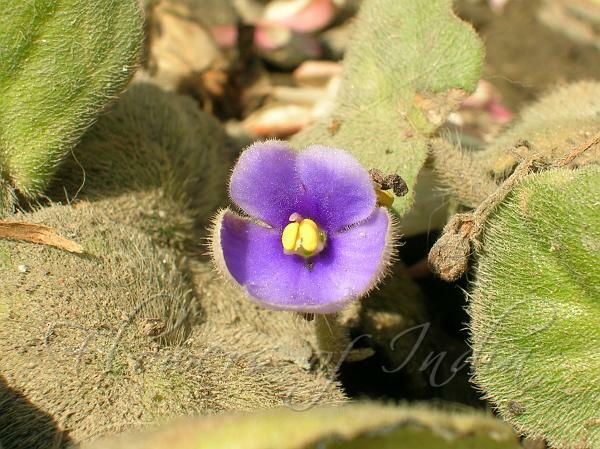 Saintpaulia is the genus to which the immensely popular "African Violet" belongs. 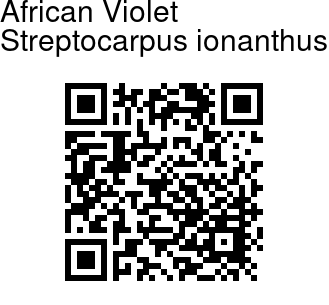 The genus is named after Baron Walter von Saint Paul Illaire, the district commissioner of Tanga province who discovered the plant in Tanganyika (now Tanzania) in Africa in 1892 and sent seeds back to his father, an amateur botanist in Germany. African violets grow from 6-15 cm tall and can be anywhere from 6-30 cm wide. The leaves are rounded to oval, 2.5-8.5 cm long with a 2-10 cm petiole, finely hairy, and with a fleshy texture. The flowers are 2-3 cm diameter, with a five-lobed velvety "petals", and grow in clusters of 3-10 or more on slender stalks (peduncles) Flower colour in the wild species varies between violet, purple, pale blue and white. African violets are well adapted to indoor culture, either under lights or on a windowsill. If kept with reasonable humidity and warmth, provided with regular moisture and light fertilization, they will provide very rewarding amounts of bloom. Photographed in the Garden of Five Senses, Delhi.